The 2016 model year has introduced many redesigned and updated pickup models. Some of them have been totally overhauled while some introduced new trim options and have been facelifted. The trend is also turned to off-road oriented packages and many of brands have offered their extreme versions. Toyota follows the same routine. Toyota has also redesigned its valuable Tacoma pickup truck for 2016 model year. This best-selling model for almost of one decade has introduced the upgrades on all fronts. The model added new 3.6 liter V-6 Atkison cycle engine which offers better fuel economy. It can be paired with six-speed manual and automatic gearbox while four-cylinder engine has returned unchanged and it goes with auto shifter only. The frame rigidity and strength has also been improved thanks to the higher percentage of the high strength steel. Restyled interior with upgraded equipment has also improved the value of this vehicle. 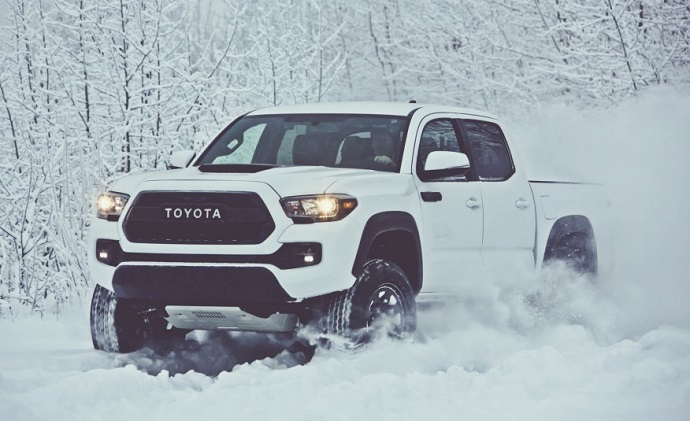 However, the TRD pro off-road oriented version was excluded from the lineup of this model for this model year and just when we thought it will be discontinued Toyota presented 2017 Toyota Tacoma TRD pro at the last Chicago Auto Show. As it is expected this model has been focused to offer improved off-road hardware and it will go with V-6 engine only. The model is based on 4WD Double Cab short bed configuration and aside from the mechanical upgrades some unique features will be seen on its exterior and interior as well. To be ready for all kind of off-road terrains the new 2017 Toyota Tacoma TRD pro has got a special treatment. All kind of enhancements has been added to its drive train which will improve its abilities. As it was mentioned the new TRD pro version has been built on the Tacoma TRD 4WD Double Cab configuration but added some great improvements. To start with its suspension, the new TRD pro features the unique coil springs up front which add one inch of suspension lift. The back end is underpinned with upgraded leaf springs with progressive damping rate which design should provide better bump absorption. The new pro version also transfers to the heavy-duty Fox Racing shocks which measure 2.5 inches and feature internal bypasses. These absorbers come in place of Blistein units which were installed on the last generation model. The model also uses part-time four-wheel drive system with electronically controlled two-gear transfer case. An electronic rear locking differential is also part of the system and while it isn’t fully locked it performs like limited-slip by adding more traction in slippery conditions. On the other hand, the power will come from the 3.6 liter V-6 only. This engine features both direct and port injection but variable valve timing as well which helps it to provide more efficient Atkison and Oto combustion cycle for better fuel economy without losing power. This engine is capable to produce 278 HP at 6,000 rpm while max torque is 265 pound-feet at 4,600 rpm. Available with this engine are both a six-speed manual and six-speed automatic transmissions. In case of the automatic combo the TRD pro is also equipped with crawl control, hill-start assist and five mode Multi-terrain system which allows driver to choose appropriate terrain mode which tailors traction and ABS parameters according to surface conditions. On the other hand the manual transmission models include special active traction control system which powers the wheels with the most grip but without impact on throttle input. From the visual point of view, the 2017 Toyota Tacoma TRD pro can’t be mistaken from something else than Tacoma but it expectedly adds specific tweaks in order to emphasize its off-road identity but also some of the equipment is functional and added to support its off-road capabilities. The protruding front fascia of this model carries same reverse trapezoidal shaped grill which however features heritage-inspired theme now. The grille is finished in black and has TOYOTA lettering in the middles while surround is body-colored. The front side also features projector-beam headlight that are framed with black bezels like the taillights and it also includes LED fog lights sourced from Rigid Industries. Up front bellow the front bumper peeks aluminum skied plate and another interesting detail is blacked-out scoop on the hood. From the profile side, notable are black-colored wheel arches and matching them are 16-inch wheels with black inserts and wrapped in Goodyear Wrangler all-surface tires. The rear side is almost identical as the conventional Tacoma models except it is signed with TRD pro badge which is also found on the front doors. Related to its exterior are also three available color options including Super White, Cement and Barcelona Red Metallic. Interior side of the Tacoma model has been redesigned and upgraded for the last model year and therefore big changes hasn’t been needed for this model. The layout is identical as the dashboard design and so on. The seat are well-shaped and supportive while the rear seating positions also provide good leg and head room. The interior is themed in black and to distinguish this model TRD pro logos are present on headrests, floor mats and shiftknob. This model as we mentioned comes in Dual Cab formation only as well as with shorter five foot bed. The model includes standard black leather covered seats that are heated and front seats are four-way power adjustable with lumbar support for driver’s seat. There is also leather-covered tilt and telescopic steering wheel, Etune based infotainment system with navigation and premium sound system, a 4.2 inch driver’s gauge cluster display which comes integrated with tilt and inclinometer gauges, etc. As all Tacomas, TRD pro also has GoPro mount on the windshield and it also include rear parking assist sonar, rear cross-traffic alert and blind spot monitoring system. The new 2017 Toyota Tacoma TRD pro will certainly be one of the best choices for off-road ready vehicle in its mid-size truck class. With the return of this version Toyota again has to offer three TRD pro badged vehicles including Tundra, 4Runner and new Tacoma models. As for its price, it will be known soon while we approaching this fall when this model will go on sale. As a reference the last generation TRD pro was sold for roughly $36k while the close equivalent, the current model year PRO off-road version with V-6, 4WD and dual cab configuration goes for starting price of $33k.